National Advocacy Organization Awards $100,000 In Grants to Nonprofits Addressing Diaper Need in U.S.
One in three U.S. families (36 percent) are in diaper need. National Diaper Bank Network, and its more than 300-member diaper bank programs, work to reduce diaper need, which impacts one in three U.S. families. NEW HAVEN, CONNECTICUT, UNITED STATES, March 12, 2018 /EINPresswire.com/ -- Twenty-three community-based nonprofit organizations that distribute donated diapers to struggling families in 15 U.S. states have been selected as the 2018 recipients of the $100,000 Funds for Change grants awarded by the National Diaper Bank Network’s (NDBN). The initiative is the only national, competitive grant program dedicated solely to supporting community-based diaper bank programs in the U.S. Six of the 2018 recipients each received $5,000 to $10,000 grants, while awards of up to $2,500 each were presented to 17 programs. NDBN’s Funds for Change grant program advances the work and expansion of local organizations serving families and children experiencing diaper need. Defined as the lack of a sufficient supply of diapers to keep an infant or toddler clean, dry and healthy, diaper need impacts one in three U.S. families, and is often a hidden consequence of poverty. 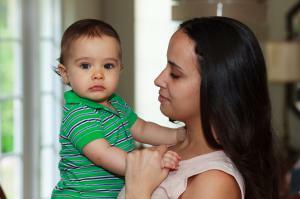 Nearly 5.2 million babies in the U.S., aged three or younger, live in poor or low-income families. • $2,500 or under in micro-funding grants for a wide range of activities and projects including, research, marketing, website design, and board development, among others. • Connecticut - The Diaper Bank of Connecticut, New Haven, to prepare diaper banks with the skills and resources needed to conduct a successful economic analysis to demonstrate the economic value diaper banks provide to the individuals, communities and states they serve. • Maryland - ShareBaby, Inc., Brooklandville, to launch and equip fully operational satellite diaper cupboards to serve hard to reach areas of Baltimore City. • Missouri - Diaper Bank of the Ozarks, Springfield, to continue the expansion of its rural diaper distribution network serving families living in hard to reach areas of the Ozarks. • New York - The HopeLine, Bronx, to sustain current storage facility to continue to receiving bulk diaper orders. • Texas - Texas Diaper Bank, San Antonio, to help diaper banks establish proactive, effective disaster response programs based on the lessons learned by assisting families impacted by Hurricane Harvey in 2017. • Virginia - A Small Hand, Toms Brook, to create and host a community-wide event centered around a Poverty Simulation, and raising awareness of diaper need in surrounding communities. Colorado – WeeCycle, Denver; Georgia – Helping Mamas, Inc, Snellville; Illinois – Loving Bottoms Diaper Bank, Galesburg; Iowa – Eastern Iowa Diaper Bank, Cedar Rapids; Maine – Michael Klahr Jewish Family Services, Portland; New Jersey – Moms Helping Moms, Union; New York – Baby Steps Baby Pantry, Newburgh; Central New York Diaper Bank, Inc., Syracuse; Ohio – Sweet Cheeks Diaper Bank, Cincinnati; Oregon – PDX Diaper Bank, Portland; Pennsylvania – Healthy Steps Diaper Bank, Harrisburg; Mitzvah Circle Foundation, Harleysville; Western Pennsylvania Diaper Bank, Pittsburgh; Texas – Austin Diaper Bank, Austin; Galveston Diaper Bank, Galveston; Waco Diaper Bank, Waco; and Virgina – NOVA Diaper Bank, Ashburn. The 2018 recipients, including 13 first-time awardees, represent both newly formed and established diaper banks serving families in all sizes of communities throughout the country, from rural areas to major cities. NDBN has bestowed more than 125 grants in excess of $400,000 to local diaper bank programs, since launching Funds for Change in 2015. Because grant recipients are required to secure equal funding from local supporters, the dollars doubles in value upon implementation. To date, the net impact of NDBN’s Funds for Change initiative exceeds $800,000. Funding for the initiative is made possible by a combination of support from individual and corporate donations to NDBN, as well as major gifts. Continued financial support will enable NDBN to expand the program into its fifth year. About the National Diaper Bank Network: The National Diaper Bank Network (NDBN) is a nationwide nonprofit dedicated to eliminating diaper need in America, by leading a national movement to help meet the basic needs of all babies and their families…including access to clean, dry diapers and other material goods. 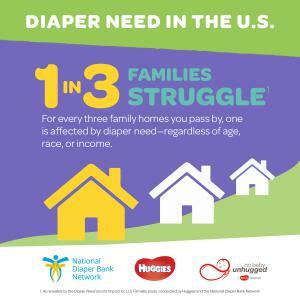 Founded in 2011 with the support of Huggies®, the network raises national awareness of diaper need (#DiaperNeed) and supports the development and expansion of diaper banks in communities throughout the country. Its active membership includes more than 300 diaper banks, diaper pantries, and food banks located in 47 states and the District of Columbia. More information on NDBN and diaper need is available at www.nationaldiaperbanknetwork.org, and on Twitter (@DiaperNetwork) and Facebook (facebook.com/NationalDiaperBankNetwork).